You could have probably read my post called 2 Nodes 10GbE Switch-Less Configs from Starwind where I’m explaining the details about Starwind’s configuration which do not uses switches. This configuration is only available for 2 Nodes, but Starwind can scale out by adding additional nodes (and switch) afterward. 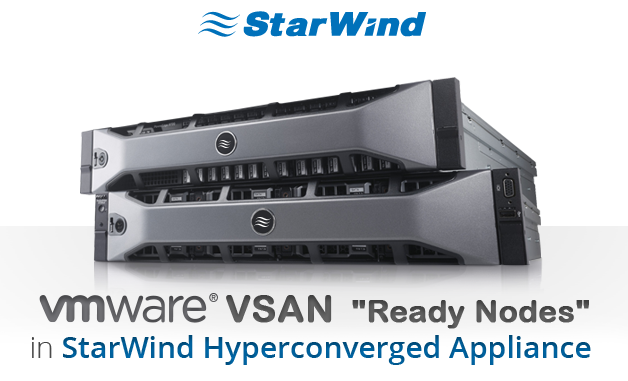 StarWind has announced recently new solution based on VMware VSAN – VMware VSAN Ready Nodes in StarWind HyperConverged Appliance. If you’re going to VMworld, you might be interested to see StarWind at VMworld where they will be demoing this solution and they will also be doing daily drawing during those three days, to win some Raspberry Pi goodies. VSA (virtual appliance) on the top of VMware (Single OVF to download and deploy). Together VMware VSAN – in this case, VMware VSAN assures traditional vSphere storage policy for VSAN. Starwind is installed as a VSA and provides additional storage services on the top of VSAN. VTL (Virtual Tape Library) – can be used as a destination for backups. Additionally, In a case of VMware VSAN Hybrid version, Starwind can do Inline deduplication (VMware does not do it in the Hybrid version. Only on All-Flash architecture). Each server is configured with RAID 5/Raid 6 for spinning media. StarWind HCA is a turnkey solution that unifies best-of-breed hardware and software components: Dell servers, Intel flash, VMware vSphere or Microsoft Hyper-V, Veeam Backup and Replication and associated software, assembled and “powered” by StarWind Virtual SAN or VMware Virtual SAN. The “ready nodes” come pre-built, pre-configured, pre-tested and supported by StarWind as a whole. Thanks to hardware and software partners, StarWind could make the HyperConverged Appliance less expensive than even Do-It-Yourself virtualization kits.